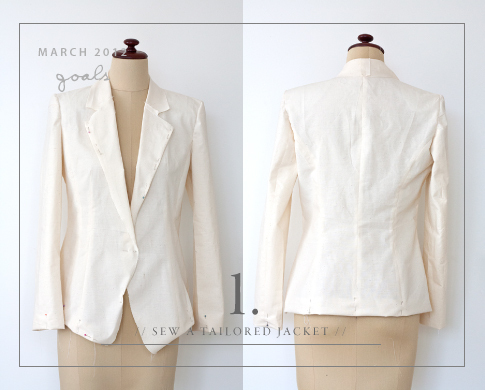 Just a quick post today to update you on the Tailored Jacket progress. 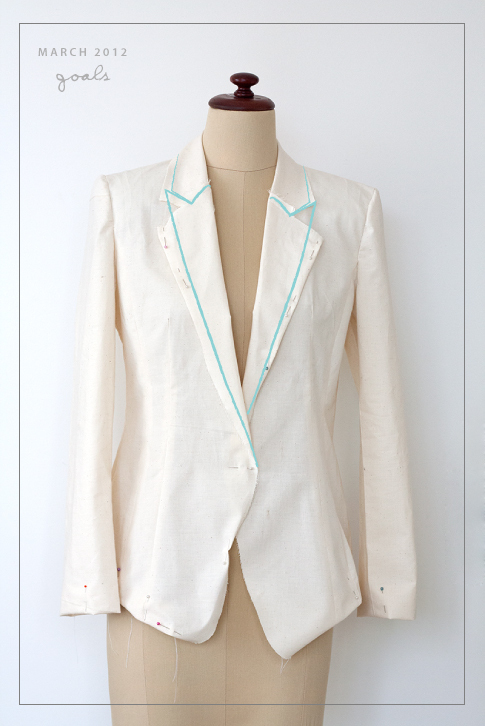 After a long and hard search for the perfect tailored jacket pattern, I realised it didn’t exist, and to create the look I was after I will just have to draft my own! But with the aim of saving time and meeting these goals I have set for myself I chose this BurdaStyle Sports Coat. I liked the low neckline/ breakpoint, the dipped front feature, and the tidy double welt/bound pockets. It also looked fitted with a nice silhouette. Well, saving time I’m really not sure if this will, as it took me two evenings to print, assemble, trace and add seam and hem allowances, and I still have a separate lining pattern to draft too! But with all that prep done, cutting and sewing the toile took no time at all and I was so excited to test the fit. This pattern has good points and bad points. I am really happy with the length of the garment. As I am tall, this was my biggest concern and it really is the least of the problems. 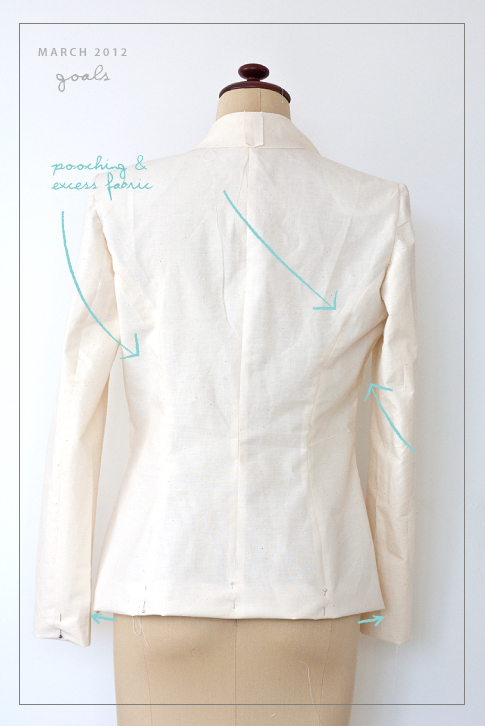 The sleeves could do with a little more length and maybe just a touch wider at the opening, but very easy adjustments there. The armholes are great, not too low, nice shape with out restricting movement. The low breakpoint at just below waist level is perfect and is what I was after, creating that lovely long opening, lengthening the figure and drawing the eye to the face. But…. There is just so much ease in this style! I cut the smallest size, size 36 which is to fit body measurements: bust – 84cm, waist – 66cm, hip – 90cm. (which is what my mannequin is sized to) and it is just far too big! I measured the toile at the bust, and waist and there is 16cm of ease included, which makes the bust a finished measurement of 100cm!!! Its not too noticeable from the front and you could get away with it. But from the back, there is just so much extra room through the back and under the arms and it is so noticeable when you move your arms. You get this pooching, and creasing across the back which just looks awful. Now I know that the pattern did say it was for sweatshirt fabric, but both the tech drawing and photos of the garments and other peoples edition showed a much more tailored fit. So I was surprised that this was so roomy.The other thing that I might change (see my sketched in lines) is the shape of the lapel and the height of the collar notch. The lapels are a bit too wide and just a touch too low. I’m thinking I also might change the lapel to a peaked lapel, similar to the Paul and Joe jacket. So it looks like it’s an exercise in grading for moi. So much for taking a short cut! But I do have to say I am enjoying the project, I like the edited style and can’t wait to get into it, and wear it out.